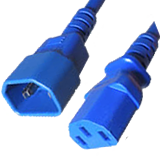 ALOGIC IEC C13 to IEC C14 Power Extension cable is mostly used with Computers Servers Monitors Desktops Printers and other similar equipments. The cable features a fully moulded design for strength and durability. The cable is Electrical Safety Authority Approved.